Ah the lovely randomness of markets - fun times indeed. 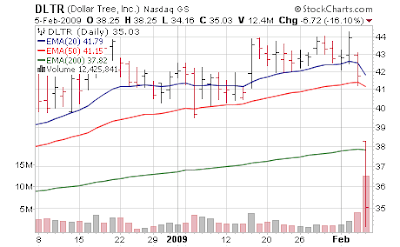 Dollar Tree (DLTR) has been one of the "Generals" of the mid/small cap space - in fact on my screen for best performing stocks of 2008 it came in 7th with a 60% return [Dec 29: Best Performing Stocks of 2008] Peer Family Dollar (FDO) reported a solid number a month ago and surged [Jan 8: Family Dollar Continues to Strengthen on "Pooring of America"] so it would only make logical sense that DLTR should follow in its step, right? Not so much. Instead this general was shot with almost no time to even put the blindfold on, even as it narrowed guidance to the top end of a previous range. Discount-store operator Dollar Tree Inc. said Thursday that its same-store sales rose 2.2 percent during the fourth-quarter and raised its earnings guidance, citing strong business by bargain-hunting shoppers. Total quarterly sales jumped 6.8 percent to $1.39 billion, from $1.3 billion in last year's fiscal fourth quarter. "Dollar Tree continues to be right for the times," said President and Chief Executive Bob Sasser in a statement. "The expanded assortment of high-value basic consumable merchandise makes our stores more relevant and continues to drive sales." Sasser noted that Dollar Tree's holiday sales were strong despite a series of winter storms across the country in December. For the full year 2008, same-store sales rose 4.1 percent, and total sales jumped 9.5 percent to $4.64 billion from $4.24 billion in the prior year. Dollar Tree now expects fourth-quarter and full-year earnings within the top half of the company's previous guidance for each period. I won't even try to hazard a guess on why a company who reported just fine was treated like this. It's the casino - it is what it is: brutal and random. Maybe it's just their "turn" to face the meat grinder. Gap (GPS) on the other hand reported -23% same store sales (versus -15% expectation) and was up 6%. I guess "it was priced in". As for DLTR ...in an instant the chart goes from "safe haven" to "death to Smoochie".